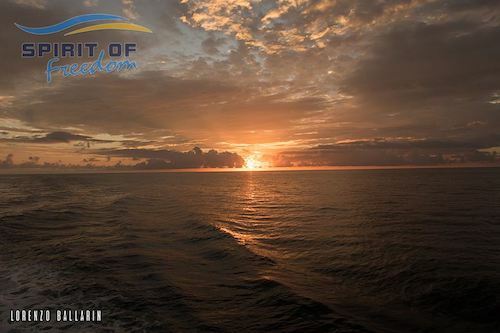 Sunday morning dawned with the bright orange sun reflecting off the mirror like surface of the ocean as Captain Ross headed for 3 Reefs and our of our favourite sites, Turmoil. 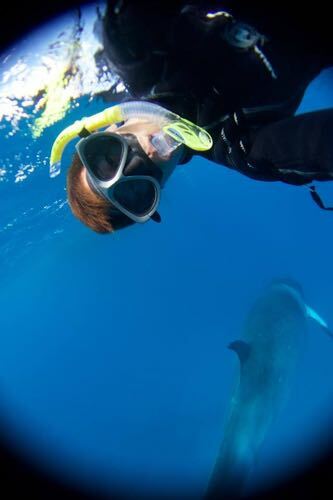 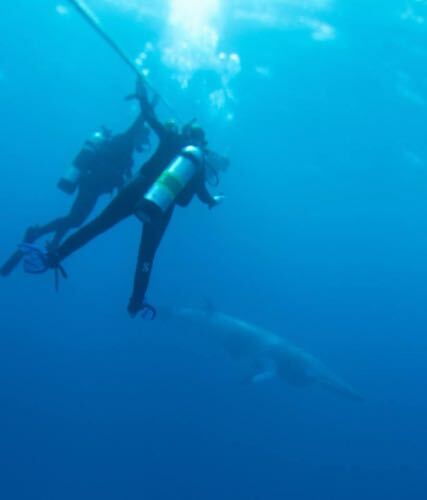 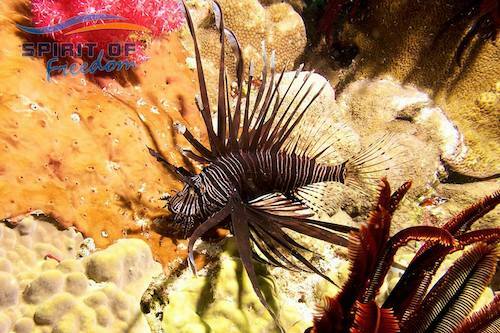 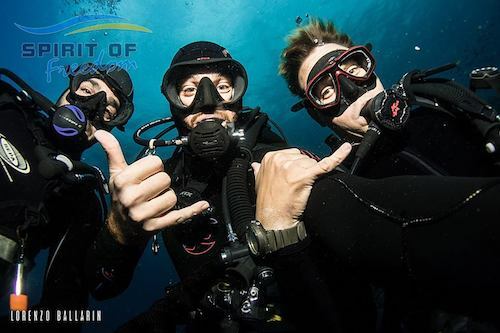 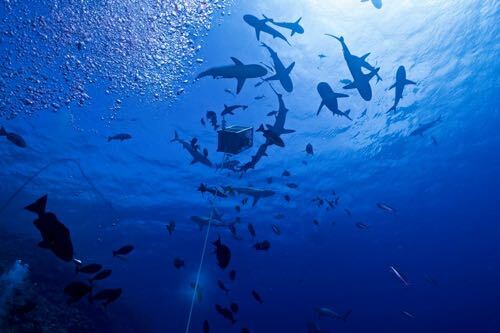 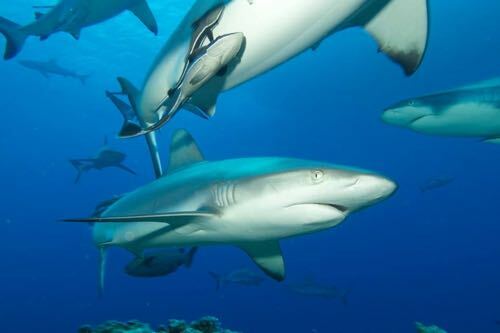 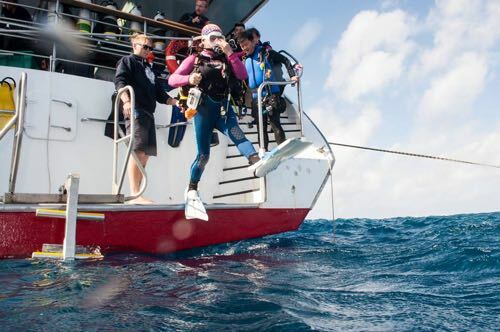 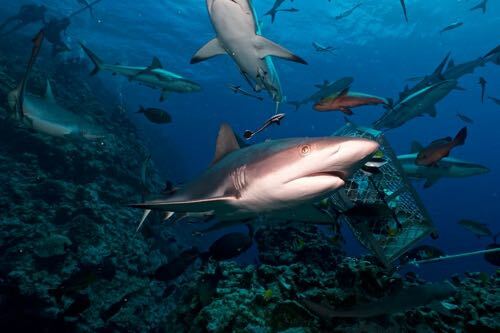 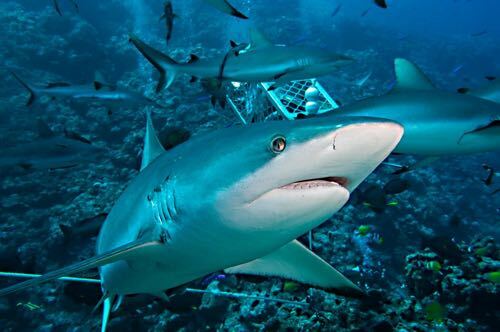 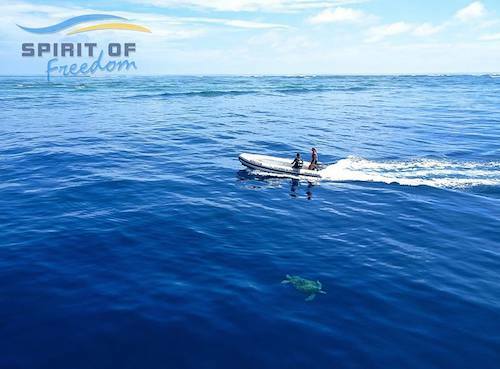 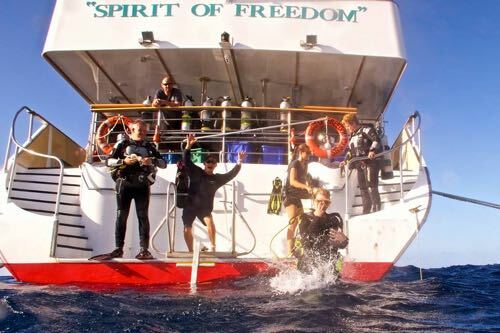 Ellis checked the current and reported that there was a slight flow on the wall towards the channel between the reefs so Ross maneuvered Spirit of Freedom into place and the divers jumped out of the port side door and swam over to the reef wall. 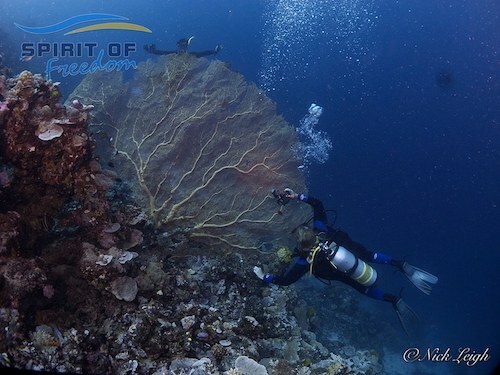 Making their way along the sloping wall covered in beautiful coral growth, the current started to accelerate the divers towards the entrance and they started to fly along, staring at the massive gorgonian fans that covered the entrance way. 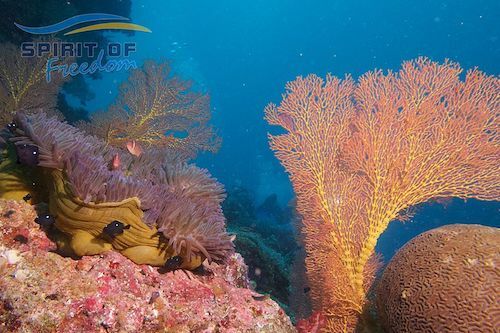 As the channel narrowed the current started to swirl and the divers entering the “Turmoil Zone” where their skills were put to the test to make their way through the swirling upwellings and spirals and out the other side into the incredible coral gardens that covered the sheltered bay inside the entranceway. 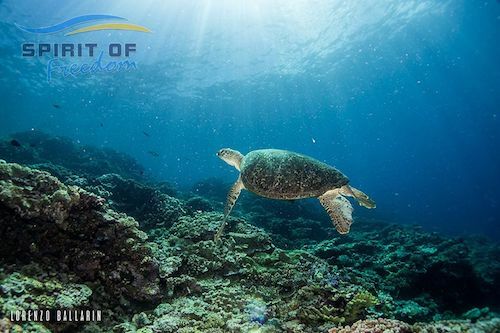 After a great start to the day it was time to head out to Raine Island and see the stunning sandy beaches of the most important Green Turtle nesting area in the world. 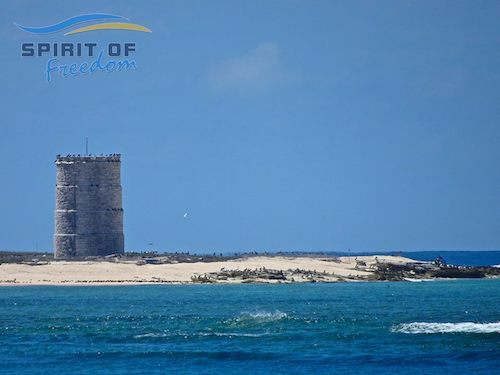 The wind had dropped over the last few days but there was still a good metre of open ocean swell rolling through on to the only areas of the island that are outside of the protection zone. 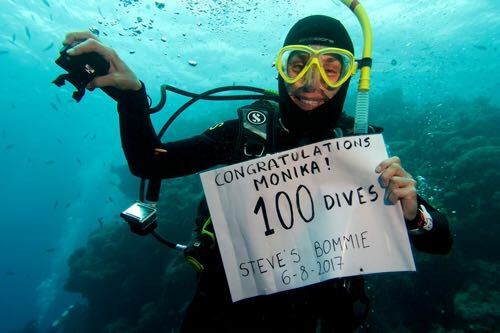 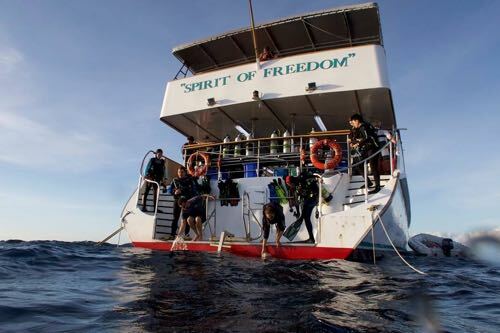 On the surface, away from the reef wall, there were about 100 turtles gathering with their shells glinting in the sunlight so the divers lined up, tense with excitement as Captain Ross brought Spirit of Freedom alongside the 180m wall and dropped the divers into the clear blue water. 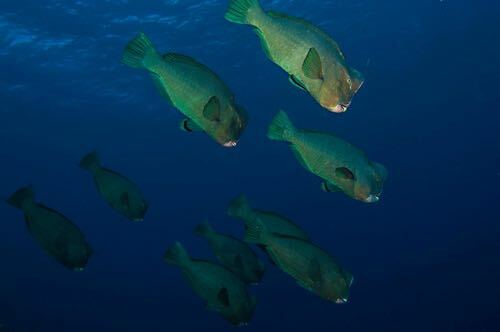 Numerous large Green Turtles were spotted in the shallows during the dives but the Turtles were very skittish and most disappeared as soon as they saw the divers. 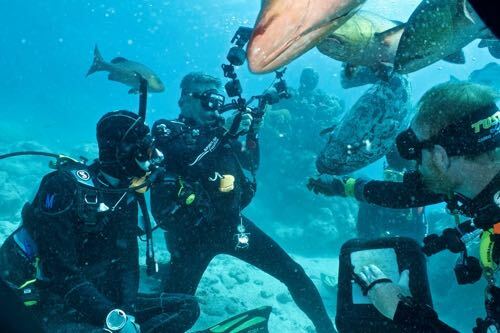 However several turtles cruised calmly alongside the divers allowing them opportunity to see the size of the mature turtles that return to the same location every year to mate and lay the foundations of their next generations. 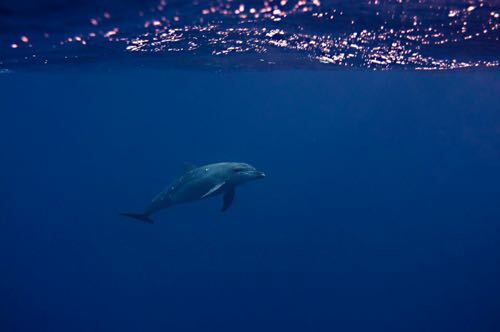 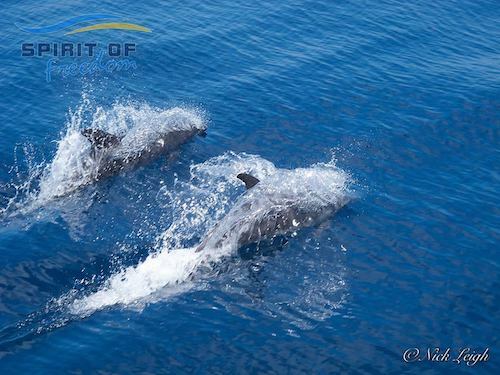 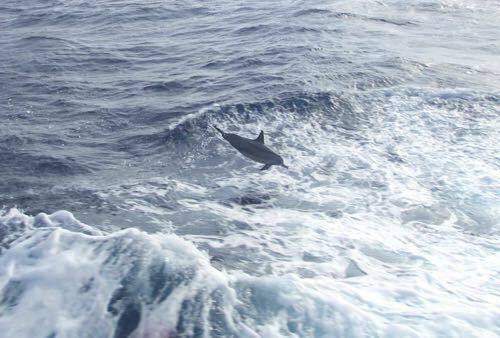 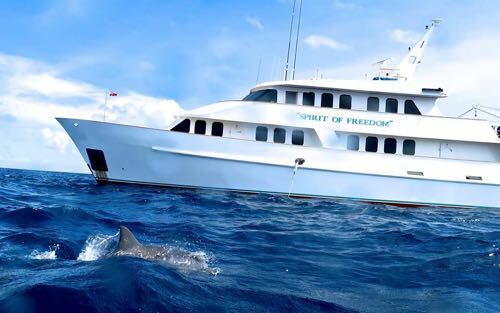 As we made our way towards the Great Detached Reef for the final dive of the trip at Perisher Blue we were treated to a pod of dolphins swimming alongside us and riding the bow wave for about 10 minutes. 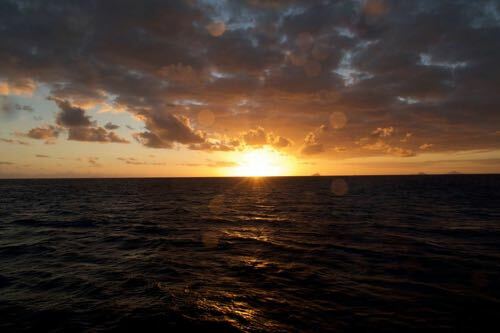 Sadly at 17:00 our diving had come to an end as we had to be able to fly back to Cairns the next day and once the dive gear was washed it was time to enjoy the beautiful sunset with a cold beverage. 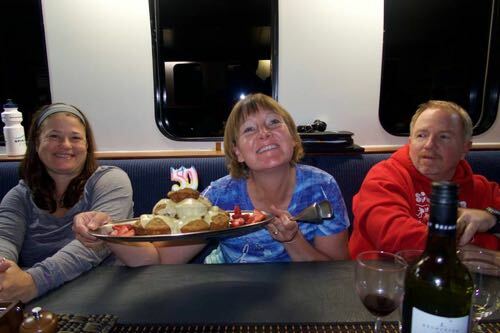 Our final night together was spent on the upper deck with an outdoor BBQ, a few drinks and lots of laughter and fun. 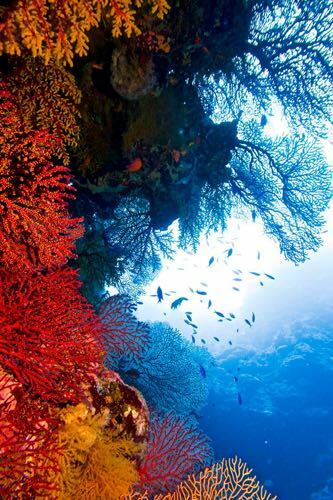 Saturday dawned with clear skies and finally the wind had dropped to a light breeze that created ripples in the protected waters behind the reef systems. 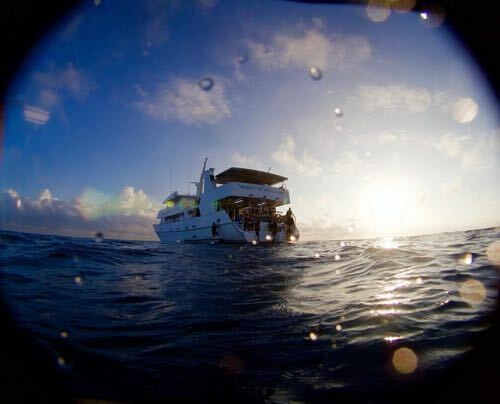 At first light the crew were in the water setting up the first dive of the day at The Deep Pinnacle in the Great Detached Reef region. 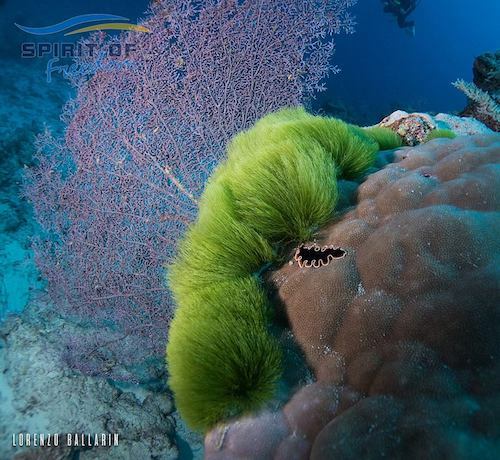 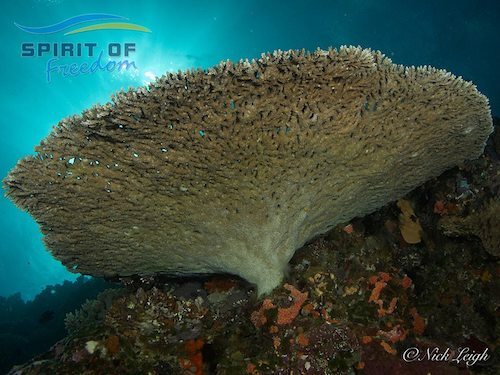 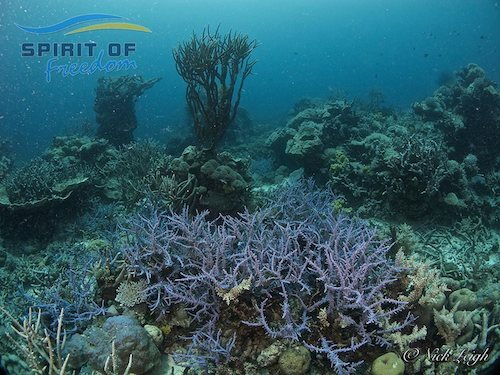 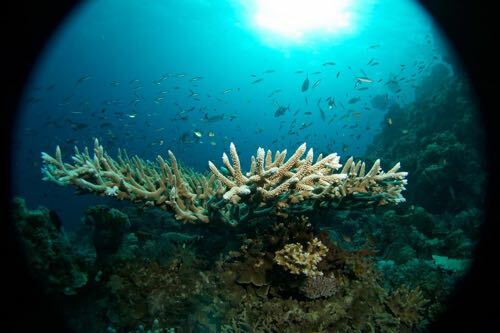 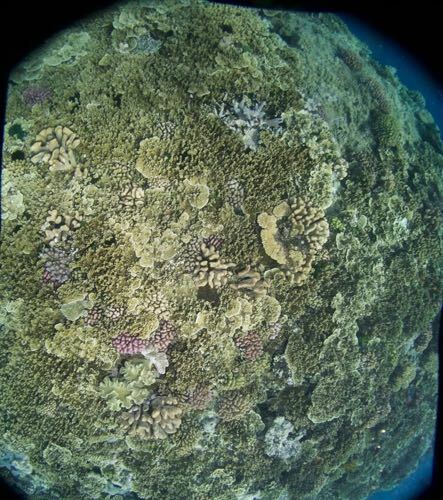 Two towers of coral reached towards the surface from the 80m slope and reached 14m at their shallowest point. 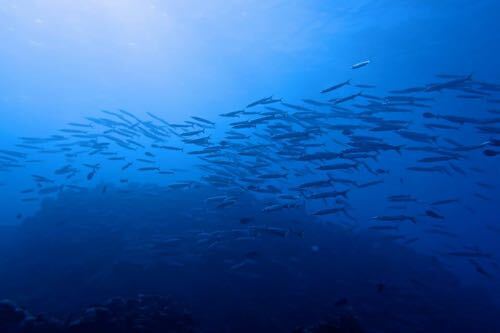 Glassfish filled all the crevices and gaps between the structures and the twin pinnacles seemed to like shimmer like mirage. 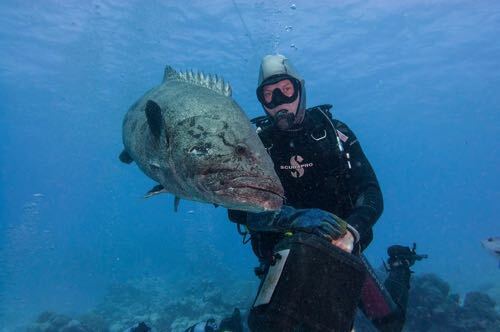 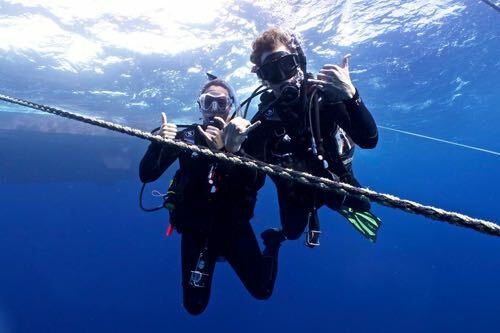 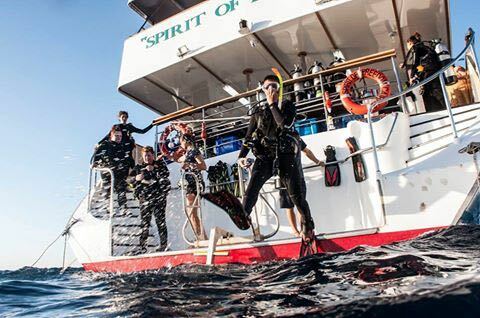 Timing was the key to our next dive at the isolated tower known as Epic! 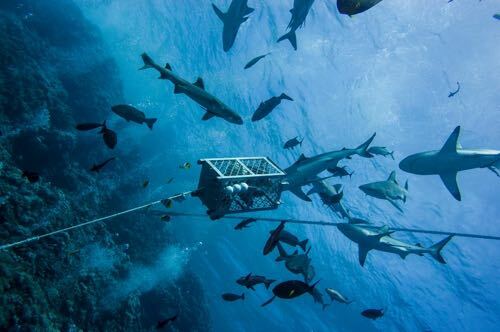 The current was raging over the top of the structure that rises from 180m deep to just 9m from the surface. 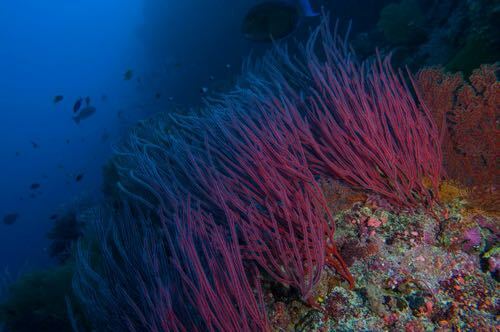 The walls were covered in colourful soft corals and Silver Tips darted around in the depths as schools of Fusiliers raced up and down the wall. 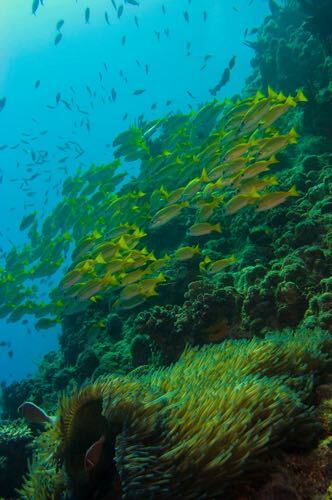 Coming over the top of the wall the current increased and brought all the beautiful Anthias, Sailfin Queens and Fairy Basslets out from their hiding places amongst the branching and finger corals and coated to the top of the site in a magical orange, purple and blue carpet of tiny fish. 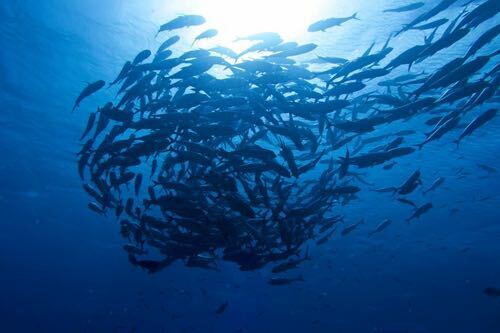 The big pelagic fish were hunting any that ventured too far and the Trevally, darted in and out creating silver flecks of light as the sun reflected off their scales. 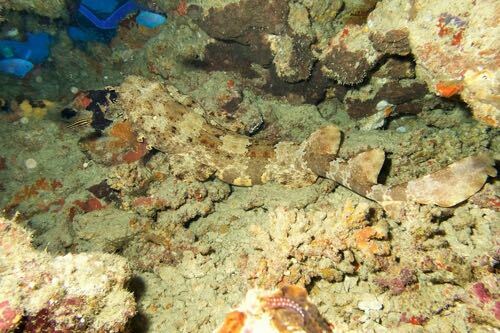 After lunch Captain Ross gave us the ok to live drop onto the seaward face of the Three Reef wall were several schools of Fusiliers darted amongst the beautiful plate, branching and boulder corals that adorned the top of the wall. 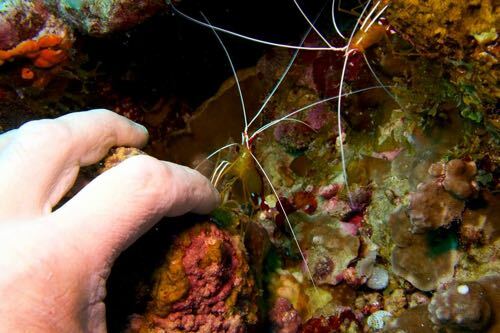 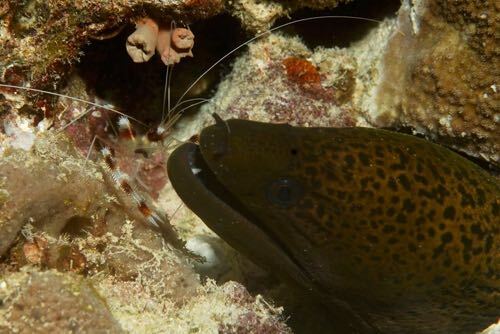 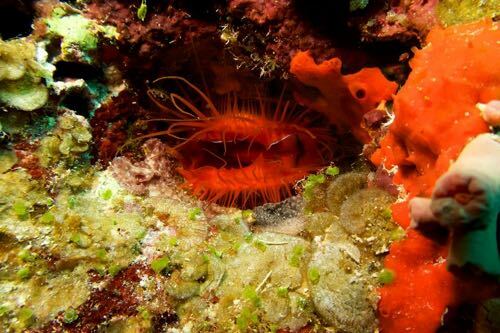 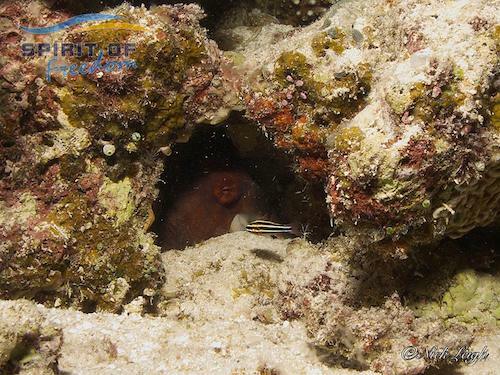 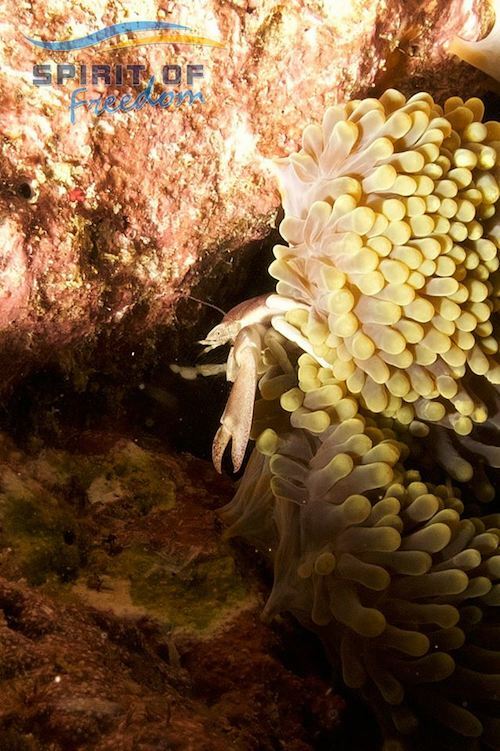 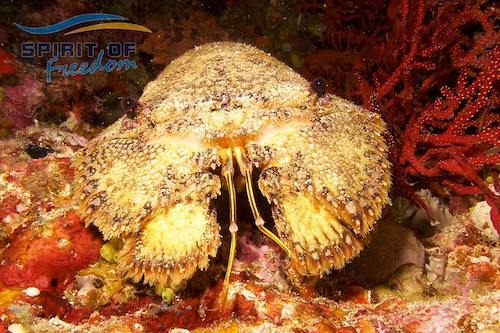 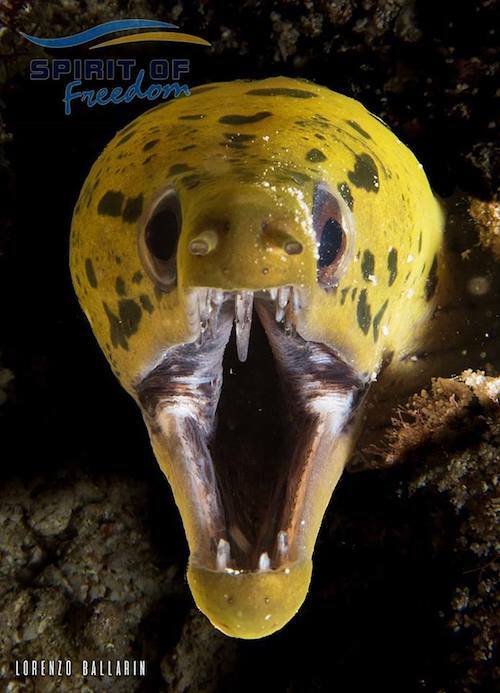 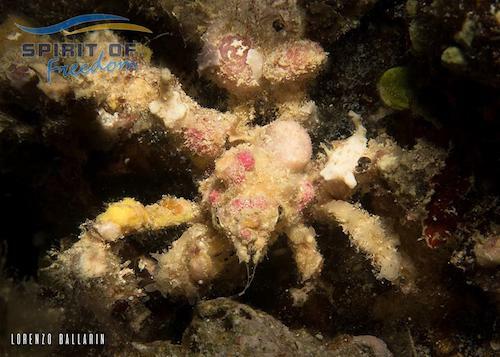 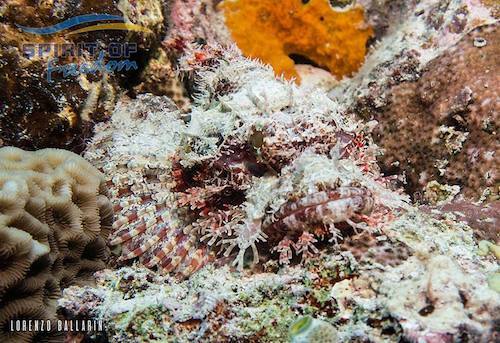 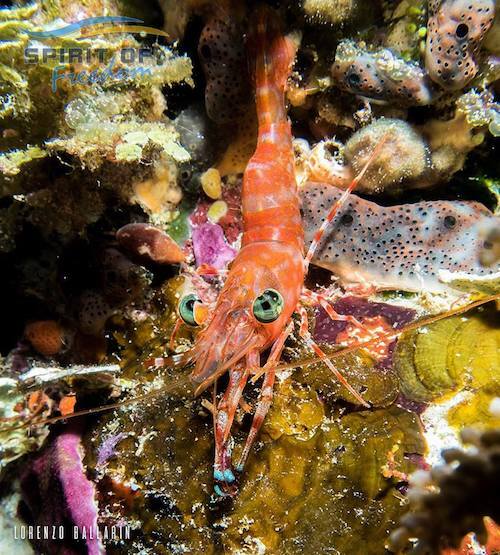 The afternoon and night dive at Big Woody gave everyone a chance to explore the tunnels and passageways at night time and we found a Segmented Tube Worm and a beautiful Decorated Crab crawling along the deep wall of the drop off. 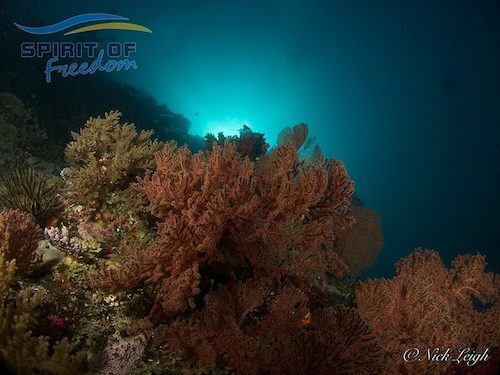 Arriving at Wood Reef in the first light of the day it was very hard to see the structure of the reef and we searched with the tender to find the edge of the outcrop that is known as Big Woody. 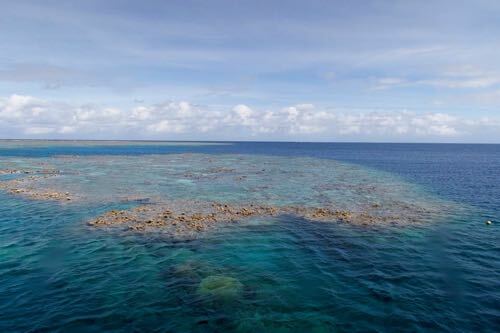 The point sticks out into the deep with the bottom over 200m below the tunnel that cuts straight through the entire tip of the reef. 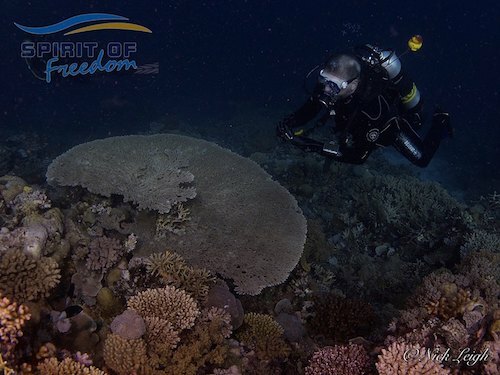 Huge soft corals cover the deeper section of the tip that was coated in a school of Fusiliers being watched by a juvenile Silver Tip Shark. 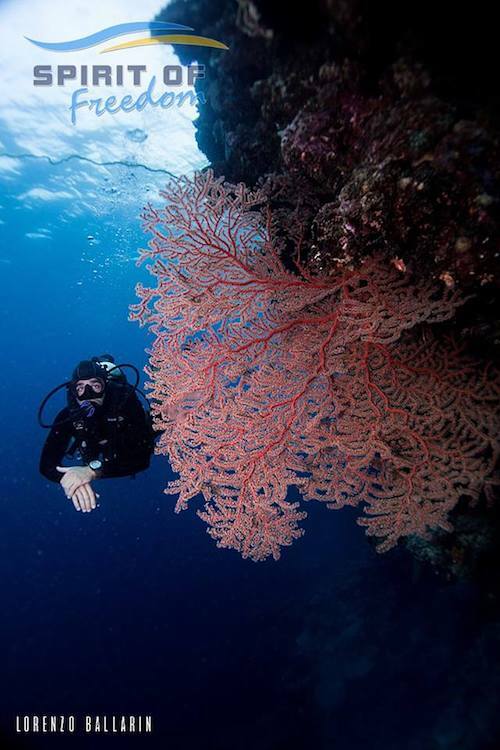 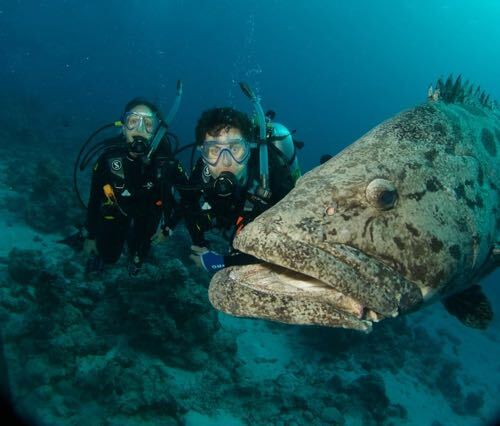 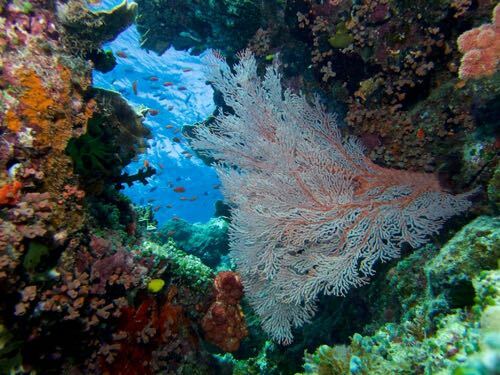 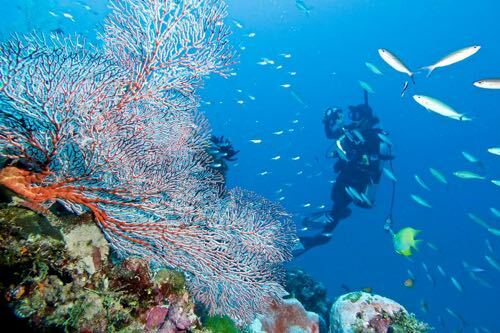 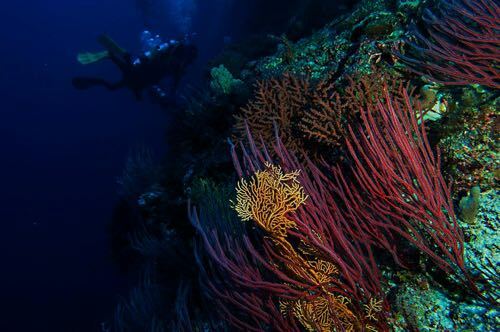 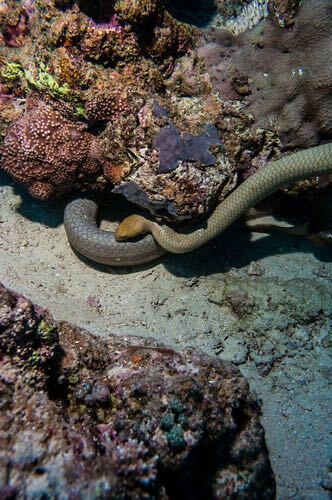 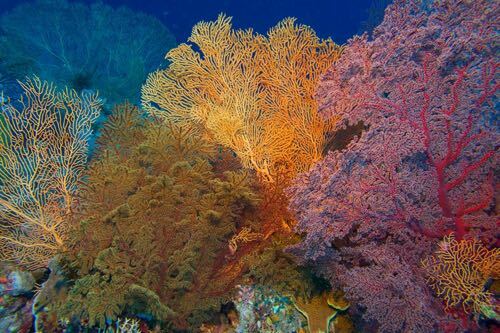 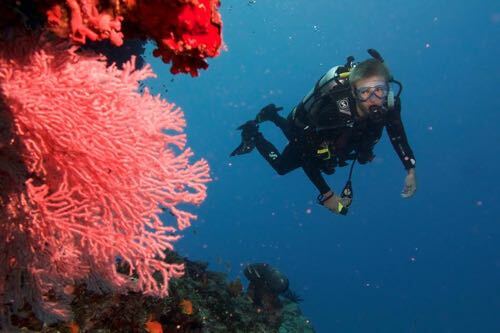 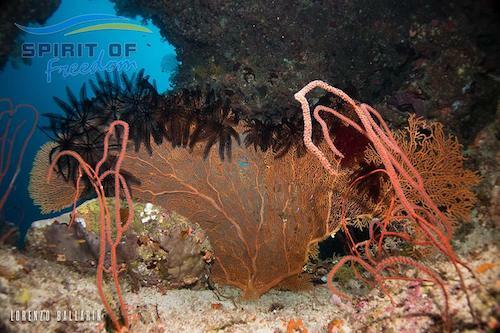 Our second dive at Wood Reef was a tender drop and gentle drift long the outer wall of the reef where the divers marvelled at the size of one of the biggest yellow gorgonian fans that I have ever seen. 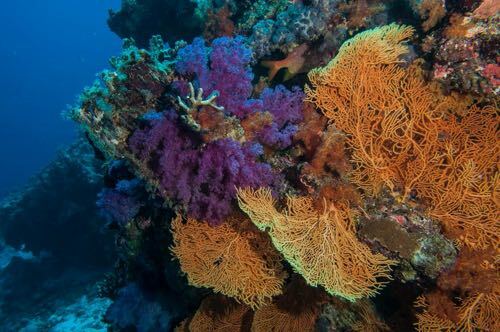 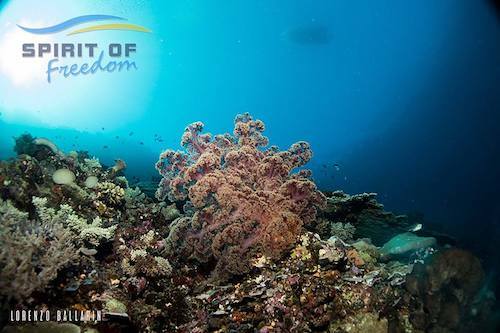 We then moved north west into the Three Reefs region and found an incredible new site that we called Winter Wonderland after all the amazing blue and purple corals that covered the sandy bottom. 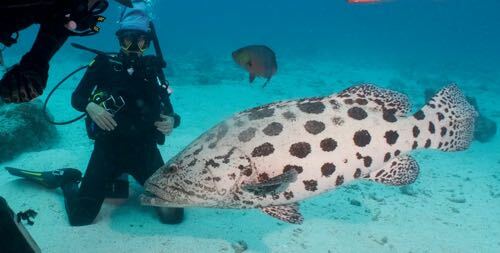 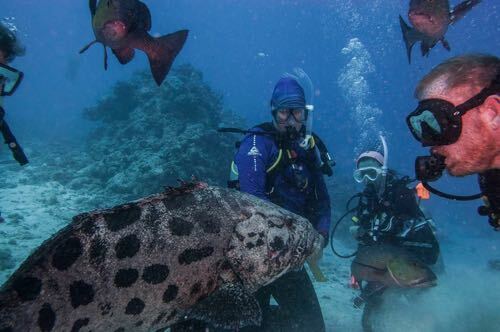 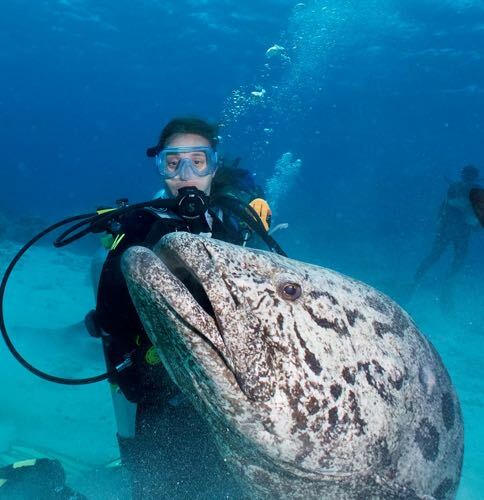 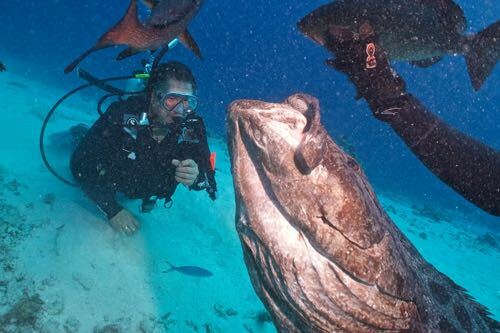 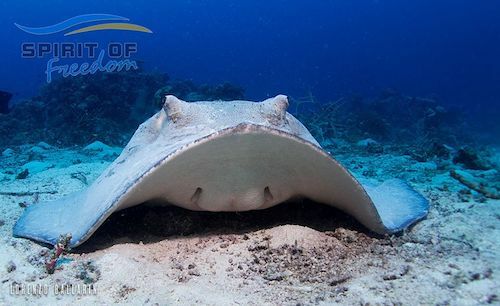 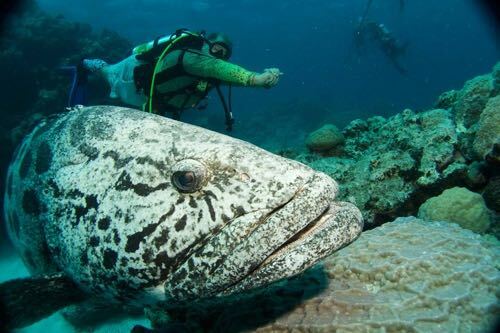 A huge Marble Ray rested, covered in sand, startling everyone as it rose and soared off into the blue, a Leopard Shark was spotted and a huge 2m plus Queensland grouper was also found making its way through the coral gardens. 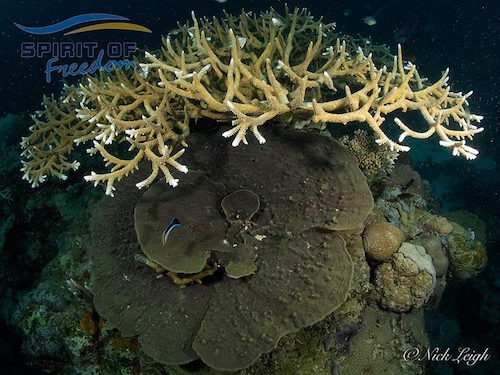 For our afternoon and night dive we headed to one of our favourite sites in the region, The Pinnacle, to spend as much time as possible discovering all the incredible macro life that hid on the towering 38m high coral structure. 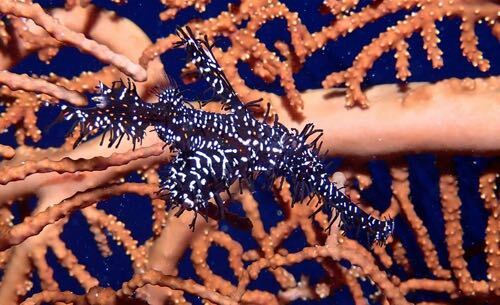 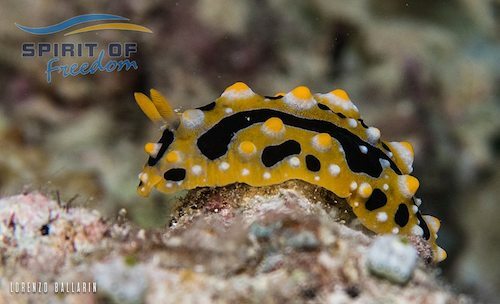 Numerous different types of Nudibranch were spotted and during the night dive several Slipper Lobsters crawled across the huge soft corals and fans. 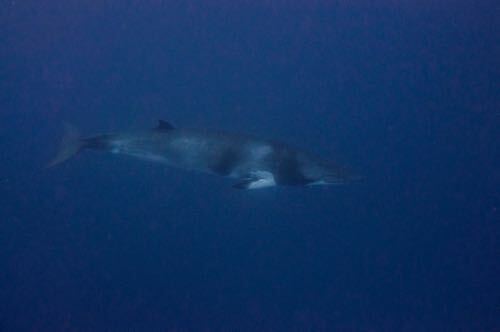 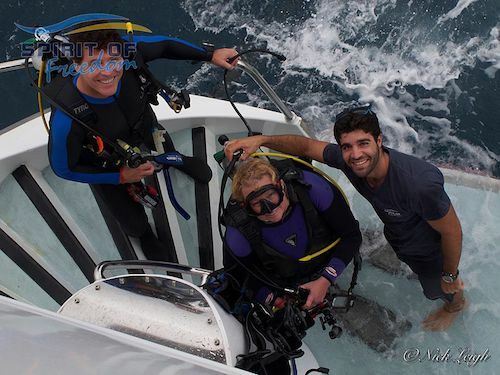 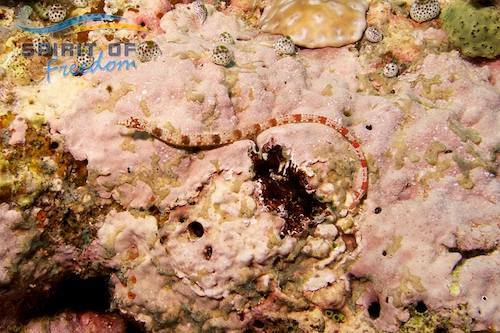 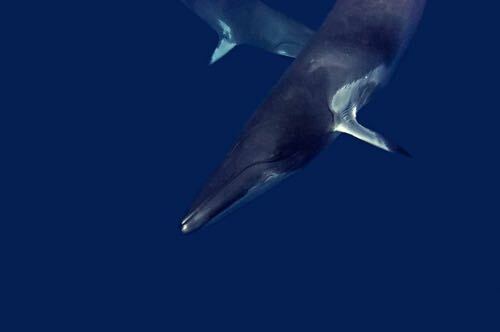 We also found 3 Pleurobranchs on the top of the Pinnacle which finished off an awesome day of diving. 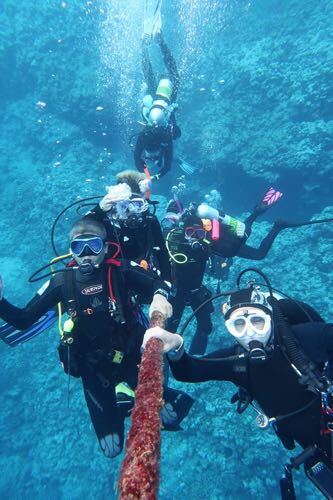 Thursday started with a live drop at Nature窶冱 Way Wall that allowed the divers to float along the wall and then across the sloping coral gardens in the incoming tide. 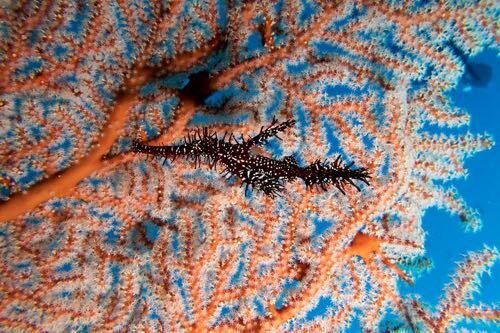 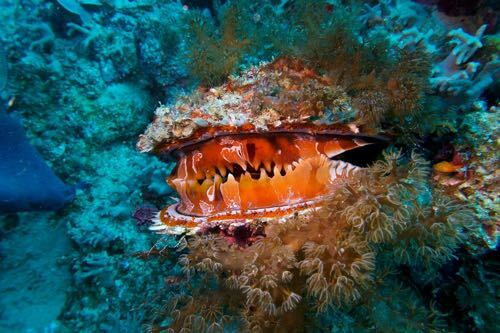 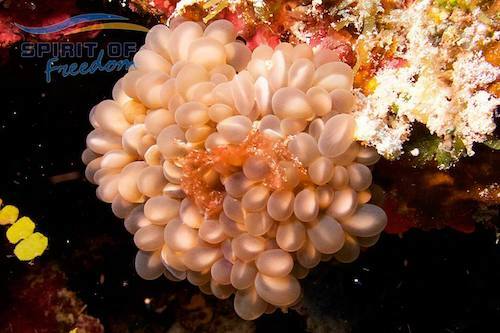 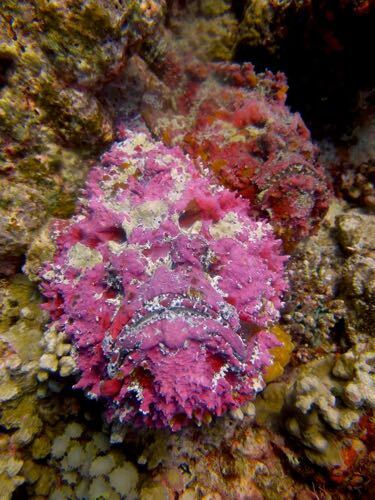 The coral was in pristine condition and lots of flamboyantly coloured nudibranchs were located, including their intricate ribbon like egg spirals. 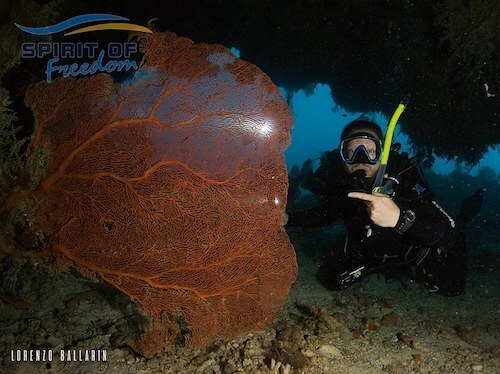 Our safety stop was spent watching the Cuttlefish mimic their background with tentacles up and spread out to look like the branching corals they were hiding in. 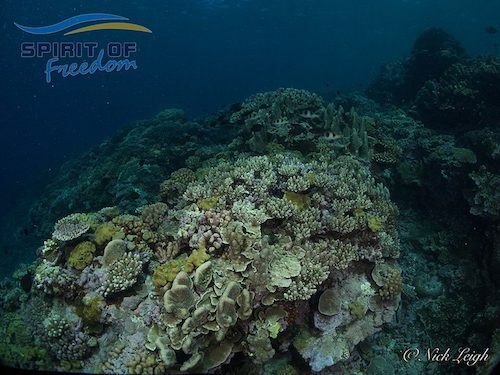 Very soon the tide turned and started running out so we live dropped onto the incredible coral formations that cover the north western face of the reef. 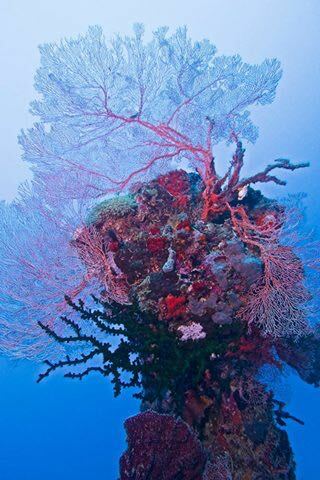 There were huge vase and foliose corals growing underneath delicate branching corals that had sprouted through plate corals in their search for sunlight like plants in the rainforest. 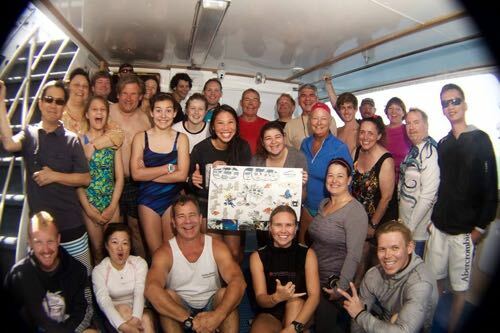 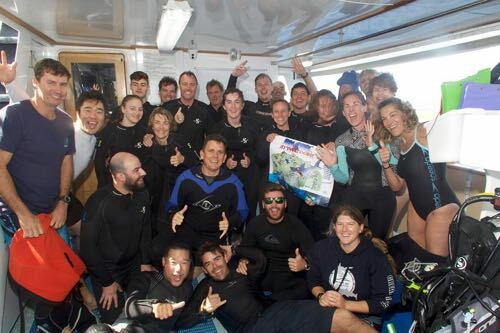 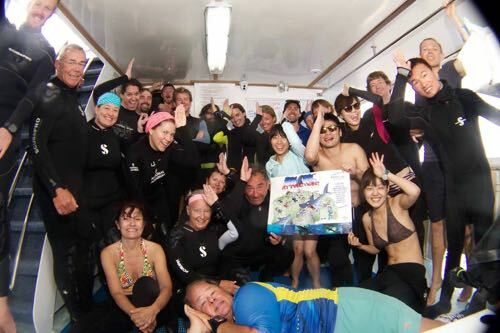 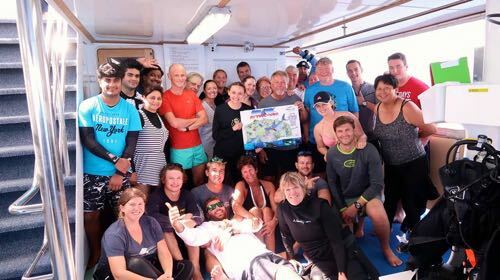 After lunch we headed through the open ocean swell and arrived in the shelter of the Southern Small Detached reef for two afternoon dives on the deep walls of Auriga Bay and a new site that we named Angels Playground. 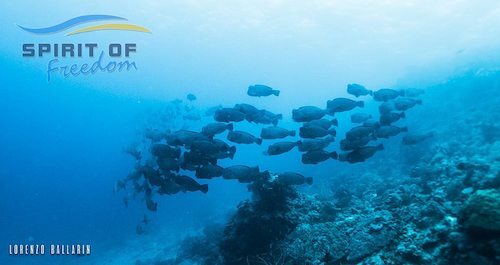 The 400m deep walls were covered in gorgonian fans and large colourful soft coral and in the shallow sandy ledges created on the edge of the drop off, Giant Sweetlips, Red Bass and Diagonal Lined Sweetlips collected together to fill the space with fish. 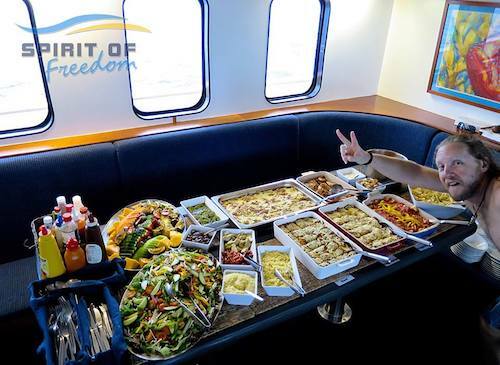 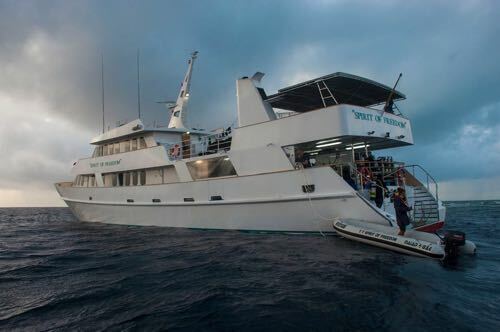 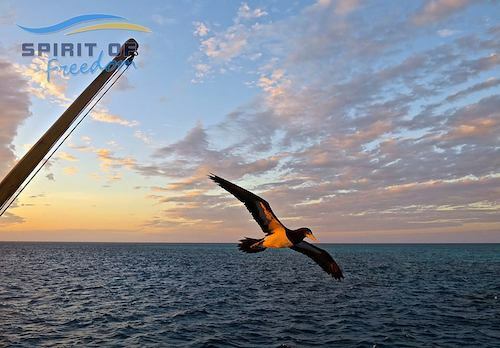 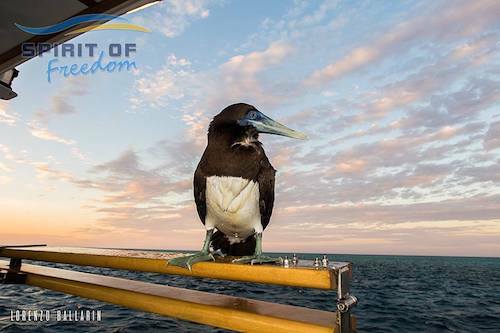 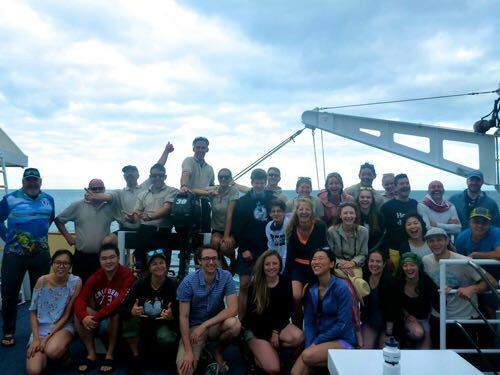 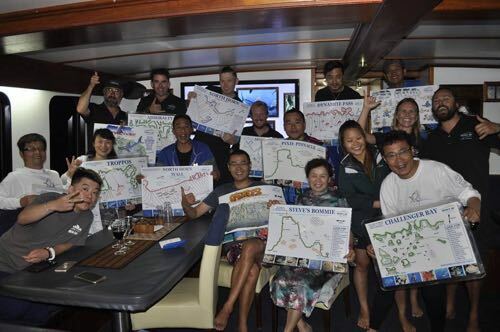 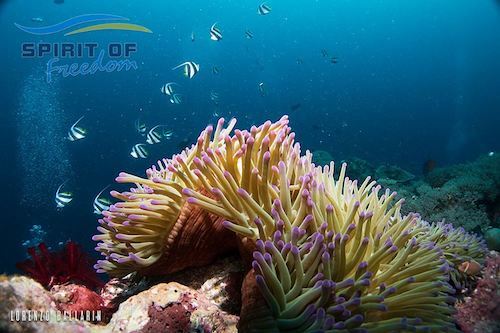 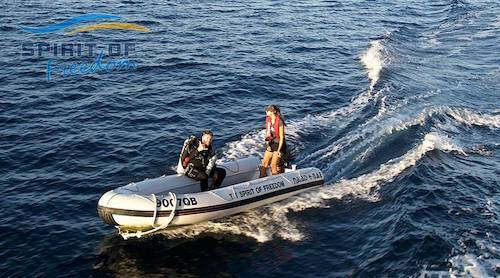 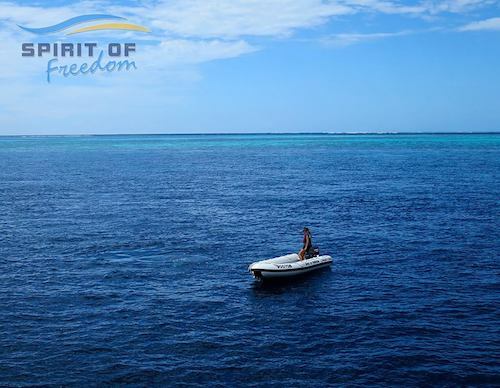 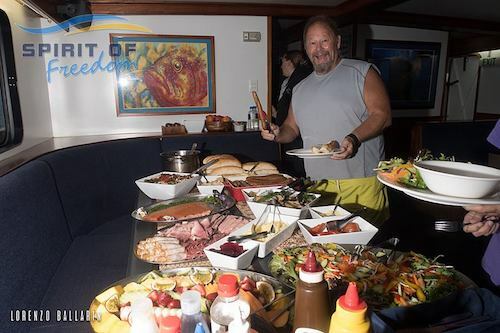 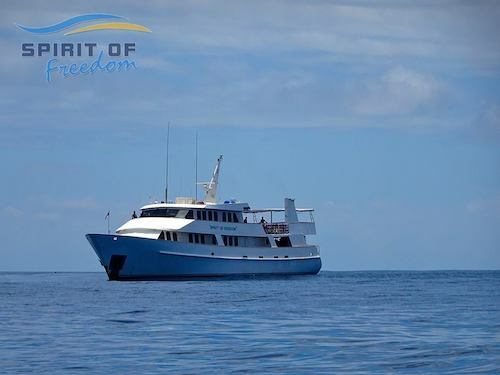 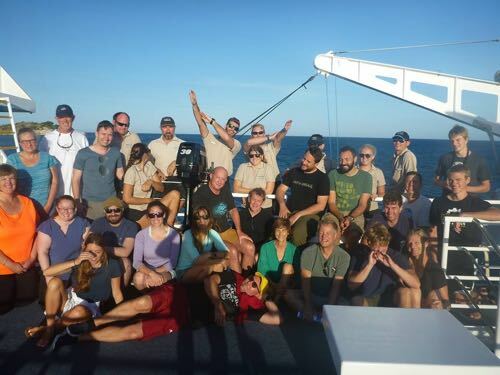 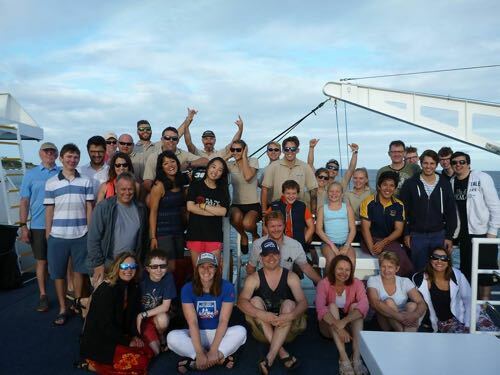 As it reached high tide and the wind creeped past the 20-knot mark the conditions became unfavourable for a night dive so once all the divers were safely on board Spirit of Freedom headed north overnight to Wood Reef and the Great Detached Reef Area. 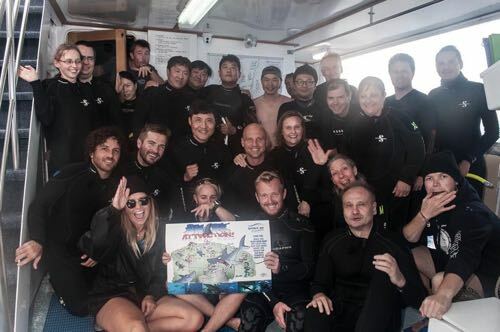 Wednesday saw our divers starting with their first expedition dives in places that very few people have ever dived before. 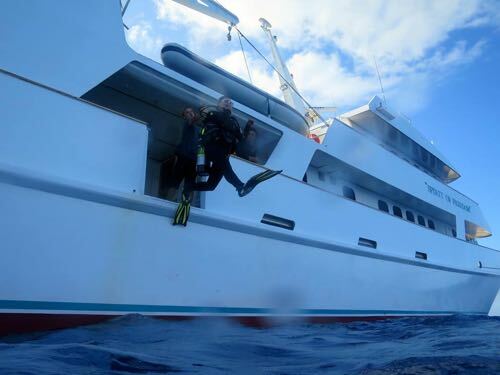 We started loading the tenders and dropping the divers along the 40m deep wall at Amazing Grace. 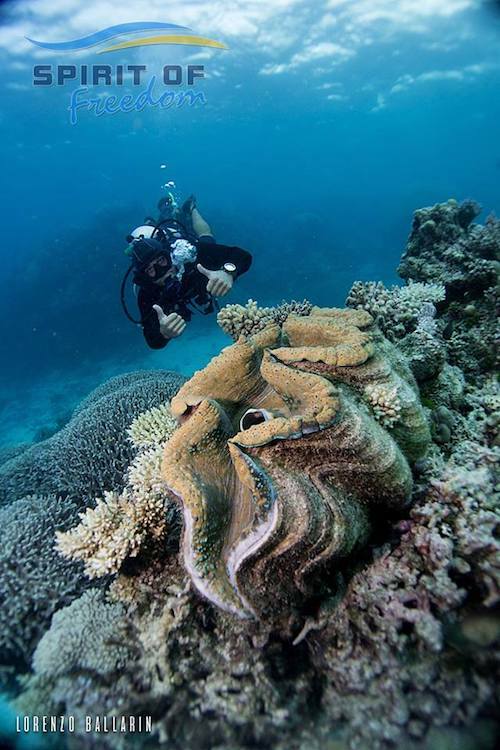 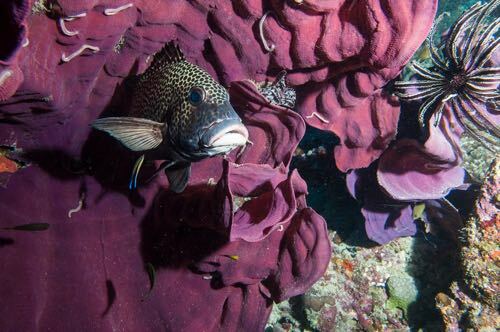 Unfortunately the big tidal changes created back eddies and swirls along the wall that meant the divers did not have an easy dive back to the boat. 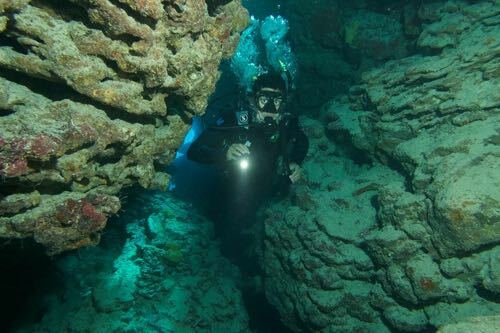 In these less often dived areas it is difficult to predict the tidal flow and the structure of the reef systems creates non linear flows so we headed to Aladdin’s Cave where we have dived every year. 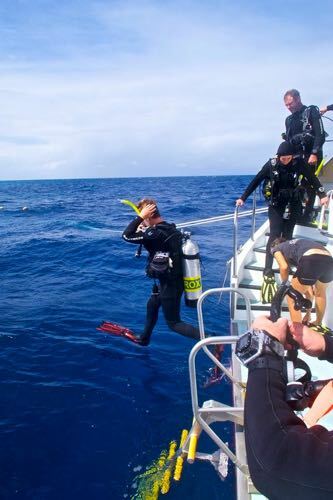 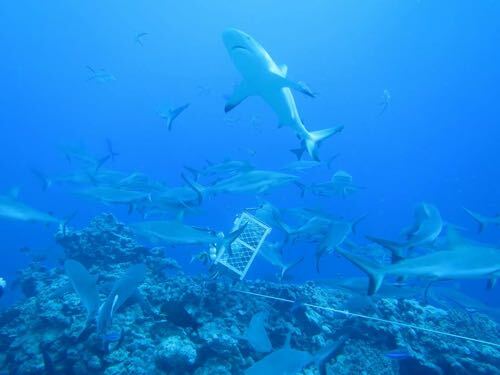 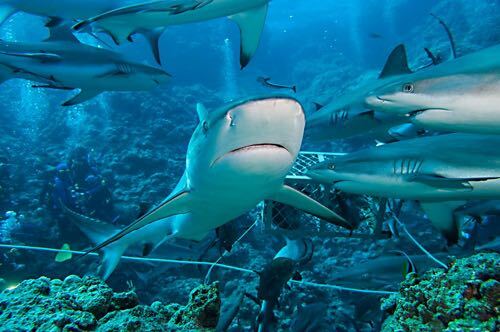 Captain Ross came alongside the reef and live dropped the divers to drift along in the current, which was flowing inwards, on an outgoing tide. 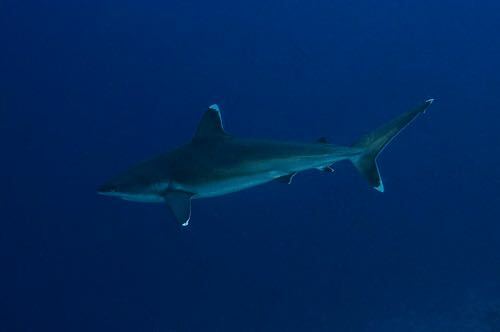 Reg & Barb headed out across the sandy shelf and sat on the drop off and spotted several juvenile Silver Tip Sharks out in the deep. 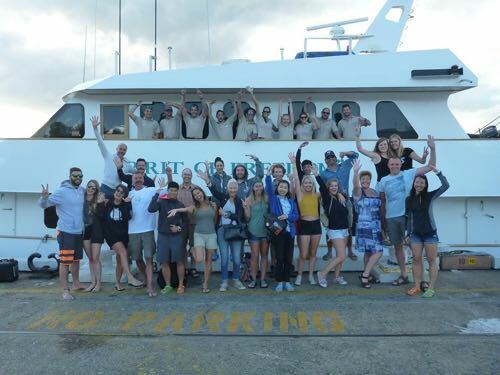 After lunch everyone jumped off the back of the boat to explore the tunnels and passageways amongst the huge coral heads on the sandy slope and encountered a huge Loggerhead Turtle cruising along. 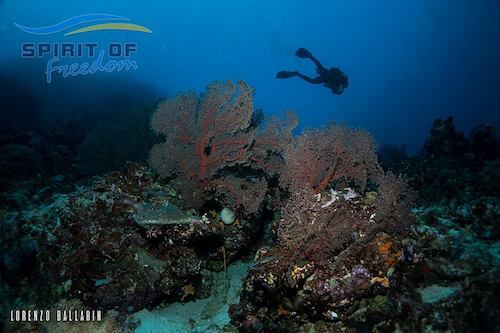 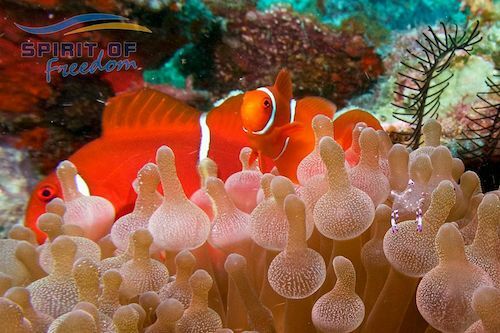 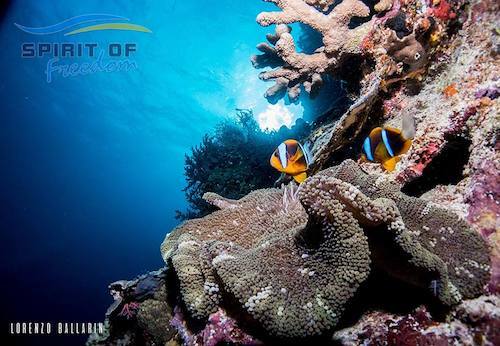 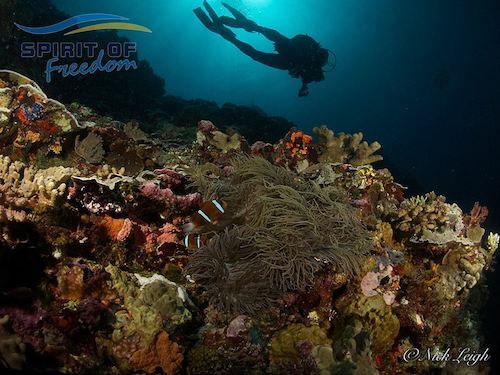 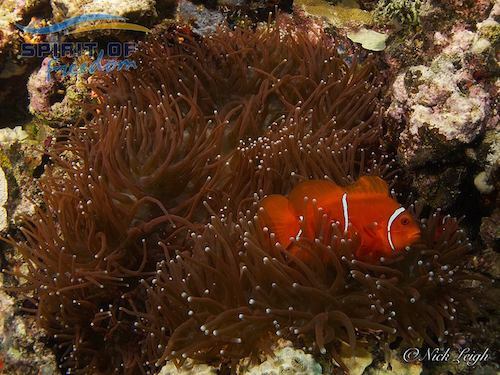 The final dive of the day was a dusk dive at Beautiful Gardens to catch the change in the marine life as the daylight faded and the reef fish hid themselves amongst the coral to protect themselves from the nocturnal predators. 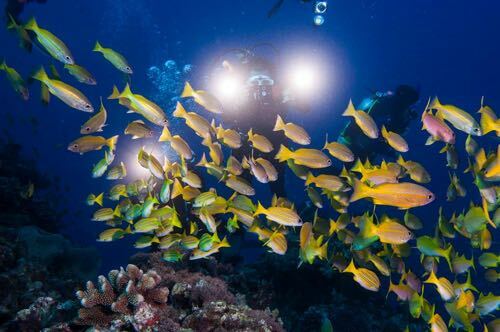 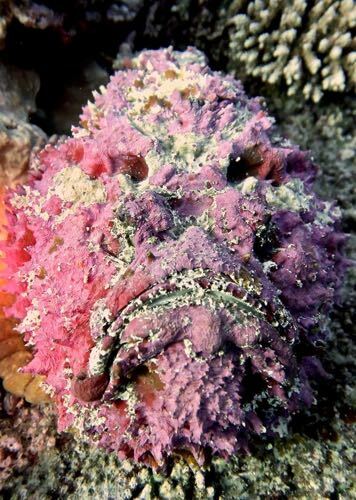 Parrotfish covered themselves in a mucus bubble and the crustaceans started to appear from their hiding places to be illuminated by the beams of the divers’ torches.